Alfalfa, a natural alternative, may help control high cholesterol, menopause and poor appetite. Alfalfa leaves also contain flavones, isoflavones, sterols, and coumarin derivatives. The isoflavones are thought to be responsible for the estrogen-like effects seen in animal studies. Although this has not been confirmed with human trials, it is sometimes used to treat menopause symptoms. Many years ago, traditional Chinese physicians used young alfalfa leaves to treat disorders of the digestive tract. Similarly, the Ayurvedic physicians of India prescribed the leaves and flowering tops for poor digestion. Alfalfa was also considered therapeutic for water retention and arthritis. 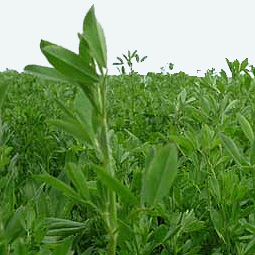 North American Indians recommended alfalfa to treat jaundice and to encourage blood clotting.